Posted in: Baseball, Character, Coaching, Development, High School Boys, Skills. Tagged: Reidland High School, St. Mary's High School, UT Martin. Chris Hicks was a four time Regional Championship baseball coach at Reidland High School. Chris describes how he instilled confidence and developed players. Also he talks about lessons he used with sports to develop boys into respectable men. Did Chris really get Dax to sing? Listen and find out. Posted in: Baseball, Character, Coaching, Development, High School Boys, Skills. Episode 3 – Doc Hideg never lost a game. Posted in: Baseball, Coaching, Development. Tagged: American Legion, Kentucky, Paducah, Post 31, Saint Louis Cardinals. 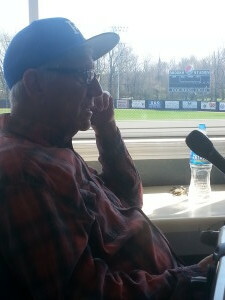 Frank “Doc” Hideg coached American Legion baseball in Paducah, Kentucky for 23 years. He accumulated 831 wins and 294 learning opportunities. The baseball field at Brooks Stadium is named “Doc Hideg Field” in honor of his tireless efforts, love for the young people and tremendous example. He discusses tryouts, college scholarships and the link between work ethic and attitude. Doc explains how fun is just part of baseball. Kids might do well to skip a day of instruction on how to tie shoes and just divide up teams and play the game.